New Images of United Primes, Bumblebees, Straxus and More! Does Takara always do it better? If you've been on the fence with picking up a handful of Takara's figures from their newly released United line, then Alfes 2010 is here to help. He's updated his blog with galleries of UN-01 Optimus Prime, UN-02 Bumblebee, UN-03 Cliffjumper, UN-05 Soundwave, UN-06 Optimus Prime, UN-07 Bumblebee, UN-08 Drift, and UN-10 Straxus. Enjoy! Keep it at Seibertron.com for the latest Transformers news on the net! Takara's metallic paint really makes those figures pop. I wouldn't mind having me a WFC Prime, BB, and Soundwave. And I'd take the other Prime as well. Not much of a fan of the metallic paint for the same reasons as Takara's Animated line. That is, it is far more noticeable against any non-metallic parts on the figure and make the different sections stand out more. Ok....quick question and I know it's probably a little late for this, but does everyone's "Straxus" have that little faction symbol, cause mine didn't have one...just wondering if this was another one of those instances like Dirge's faction symbol. I want that Prime mold, not the WFC one the other one I really like it. AutobotMR2 wrote: Ok....quick question and I know it's probably a little late for this, but does everyone's "Straxus" have that little faction symbol, cause mine didn't have one...just wondering if this was another one of those instances like Dirge's faction symbol. DAMN! DAMN! And damn again! I was hoping I'd be happy sticking with my Hasbro Drift and Darkmount. But seeing these pictures I'm not so certain. Drift appears to be made from a purer white plastic, and I'm liking the insignias with the white outlines. As for Darkmount/Straxus; I prefer the overall look of Hasbro's version, but I'm struggling to ignore the details of Takara's. 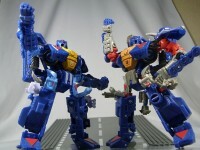 This will be the toughest year for making the decision between Hasbro and Takara figures. gotta say in most cases there the United versions are not doing it for me. WFC Optimus and Soundwave make their Hasbro versions look like cheap KOs, sure, but I'm not too keen on the metallic paint for either BB toy or Cliffjumper. And isn't the Henkei BB that the new gold BB is with? I'd have preferred that if they're going to use that colour for the main body they give him a facemask and call him Goldbug (that I might well have bought). Drift looks a bit better, but just like I said about Jazz in the other thread, not enough for me to justify spending the extra money. Straxus looks almost completely different, and I really only want his head, in a jar, so I can live without either of them. Don't eat the yellow Drift. funklizard wrote: Don't eat the yellow Drift. I. am. LOVING United Soundwave and Drift! Soundwave almost looks like he came right out of the game and I was originally going to get the Hasbro Drift, but now that I see these comparisons I think I like United Drift's white alot better, hope I can find them for a decent price! I like that the faction symbols most of these are the proper colors instead of black or silver or gold or whatever Hasbro seems to be using on the majority of the figures I've bought lately. I'm not sure if I like the metallicy decos or not, though. No sense in getting the united version now, is there? I'm wanting that Soundwave and that Optimus. Wow that UN01 Prime looks good. Anyone else getting it? I actually kinda miss those days of AEC when the main lines were running almost in synch with each other and choosing the paint apps you liked best. I miss it and then I think about how much work it seemed like. Maybe this is what's helping me reintegrate into the forums. That sense of working towards a shared goal with a like-minded community. Or maybe it just comes and goes. Whatever, I'm crazy. 4,585 pages were recently viewed by 745 unique visitors. This page was viewed 1 times on Thursday, April 25th 2019 9:52am CDT. © 2019 Seibertron, Inc. DBA Seibertron.com. All Rights Reserved. Established June 2000. Seibertron.com is owned by Ryan Yzquierdo.